This is a special look into Show 305. To listen, click here. When 14-year-old Matthew Hakkarainen pulled the bow across the strings of his violin and the last note of the Kreisler Praeludium and Allegro rang out through Gusman Concert Hall at the University of Miami’s Frost School of Music, the audience erupted in applause. 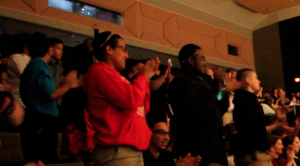 350 middle and high school students filled the auditorium with cheers as they leapt to their feet, showing their huge appreciation for his performance. From the Top does not usually present their live recording for all-school audiences, so we weren’t really sure what to expect. We were definitely not expecting the electricity in the air. Each From the Top performer took the stage and the audience leaned forward in their seats. As each performer played their last note and took their bows, the audience sprang up and filled the audience with thunderous applause that rivaled the sounds of the South Florida rainstorm happening outside. Next up on our Miami residency, we’ll be taking our music into classrooms of the schools who are part of MusicReach. We’re so grateful to meet and play music with kids in schools across Miami, and we appreciate the support from the William R. Kenan, Jr. Charitable Trust and the Howard and Geraldine Polinger Family Foundation who have made this residency possible.